Heat 2 tablespoons olive oil to medium heat. Add the onions, bell pepper and garlic, season lightly with salt and pepper. Cook for 6 minutes, add chipotle and flour; cook for another minute. Add the chicken broth, paprika and oregano. Reduce heat and stir until sauce becomes thick. Remove from heat, add in shrimp, scallops, quinoa, zest, juice and chopped cilantro. Stir to combine and let cool for 15 minutes. Add cheese and reserve. Add 3 tablespoons of olive oil to an oven safe skillet, preheat to medium for 5 minutes. 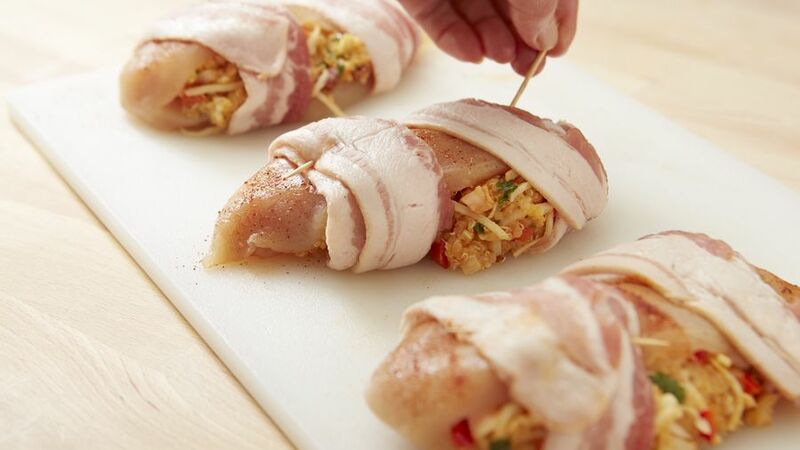 Slice the chicken breast open to create a pocket. Season both sides of chicken lightly with salt, pepper and smoked paprika. 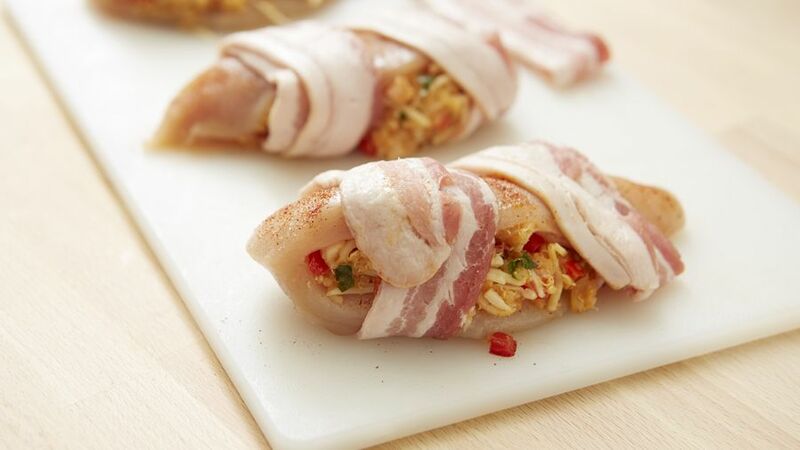 Stuff each chicken breast with the seafood filling, wrap with two strips of bacon around the center and secure with toothpicks. Carefully transfer to preheated skillet, faced down. Brown for 5 minutes per side, cover loosely with foil and transfer to the oven, in skillet, and bake for 40 minutes or until internal temperature reads 165°F. Remove from oven and let rest for 10 minutes before serving. Serve with remaining seafood/quinoa filling and a fresh green salad if desired. When buying the chicken breast ask the butcher to cut open them for you. 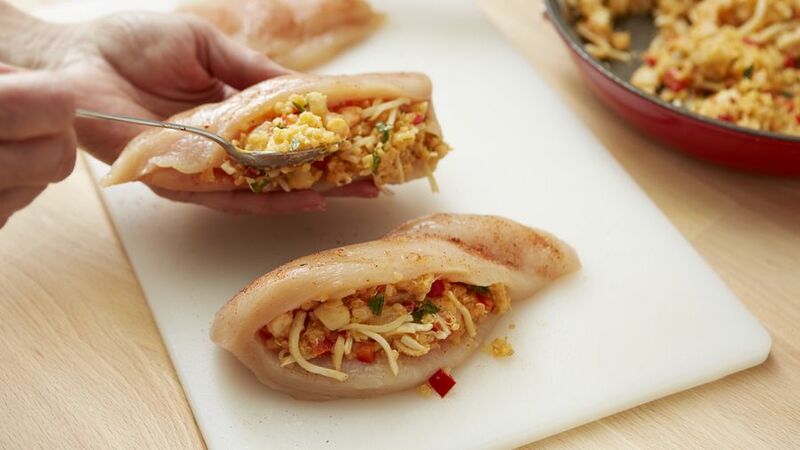 Sonia Mendez Garcia What better way to enjoy this chicken breast recipe, than to stuff it with seafood, quinoa and cheese? 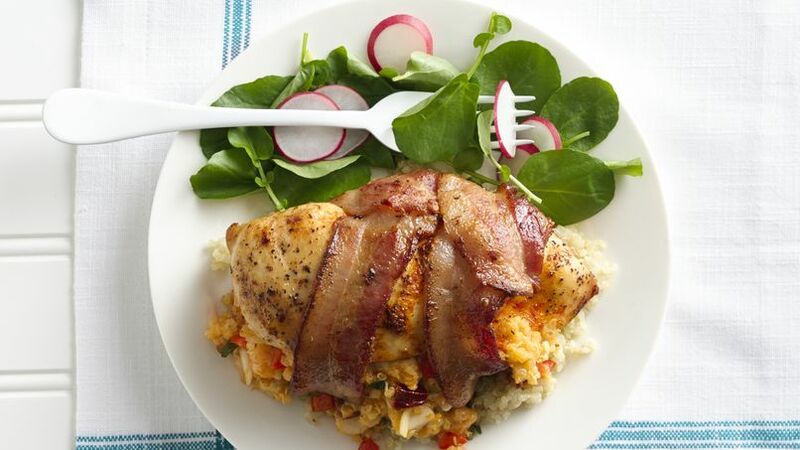 Take a plain and simple chicken breast and transform it into a spectacular stuffed chicken dinner all wrapped up in thick cut bacon! Did I mention it was stuffed with shrimp and scallops too?